and my first go at it. My first wet wash went in. You can see the simple sketch under it, with some particular attention paid to the log, which I wanted to draw the eye to. I preserved that little spot of white to allow myself to drop in a warm color there in step 2, but with a clean edge. In the next step, you can see me laying down some dull, pale warm shadows on the mountain. The paper is still warped at this stage, so it's got moisture in it, but the surface is actually dry, and after I lay my strokes down I have to soften some of my edges manually, with a thirsty brush. step 2- a bit of dull, warm shadows on the mountain. step 3- the trees go in, and the hard reflections too. Fortunately, the river water went in, and i liked it. Same for the foreground tree, with some Chinese White dropped in, wet into wet. Some of the mistakes began to fade, but I still didn't like the trees to the left. What to do but go for it? I looked at the photo and decided part of what I liked was the shaded snow, and that there was a slight shift in value as you added up all those little snowy twigs. I mixed up some Chinese White and Cobalt Blue, grabbed my handy dandy "dagger" and went about dancing with it This was fun, and I instantly knew I had made a decision I was happy with. Jaws, failure, grabbing out of-- all of that. I submitted this to the Epperson Gallery for the "All Along the Sierras" competition. 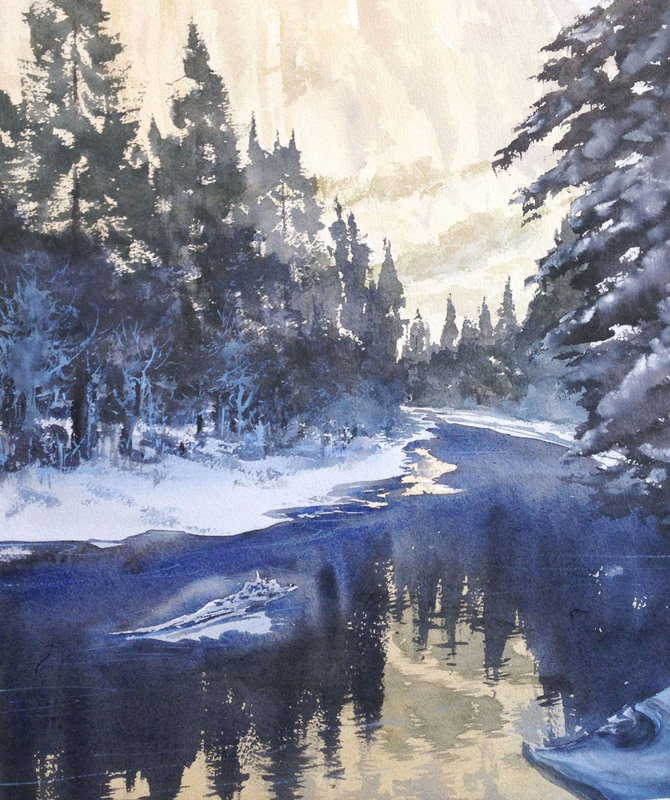 But looking at it, I felt that there was too much importance resting on the mountain, and not enough focus on the river, which had always been the reason I was painting this. After much asking around and taking of opinions, I decided to be a total twerp and follow my own opinion. I digitally cropped it and have been much happier since then. Perhaps my darks could be darker here and there for some pop, and perhaps I could show more river, but in the end I've let it be and moved on. Sometimes I have to live with those sorts of doubts and just start painting something new.